It is now less than 10 days until the UK’s Referendum on its membership of the European Union. This momentous event in global markets has the potential to turn into a unique trading opportunity. Brexit offers some unique opportunities for the contrarian trader & in this article I’ll explain why and how I am trading against the crowd. Economic and financial implications of the vote are widely covered and lots of research is available via financial institutions and on the web. Betting odds this morning are forecasting a 62% probability in favor of the UK remaining in the EU and a 38% probability of Brexit. In an effort to provide something unique to Forexop.com readers I decided to share with you one of my trades that I have already done on my personal FX trading account. 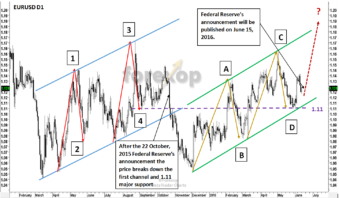 In this post I will present a contrarian trade on EURJPY and the logic behind it. If you haven’t read my previous post on contrarian trading, I would suggest having a look at it before moving forward here. It will give you a sense about my definition of contrarian trading and my underlying philosophy. Since EURJPY is a cross rate, before discussing factors related to it, I am going to look at EURUSD and USDJPY. I will discuss technical factors, which will provide support that “the Crowd” is selling both EURUSD and USDJPY and that the Brexit is a good time to go against the Crowd by going long EURJPY. Wave 1 and wave 3 of the first channel are equal in length. The same we have for the length of waves A and C of the second channel. Wave 2 and wave 4 of the first channel are equal in length. The same we have for the length of waves B and D of the second channel. Wave 4 and wave D ended at around 1.11. Maximums of both channels (end of wave 3 and end of wave C) are very similar spikes. 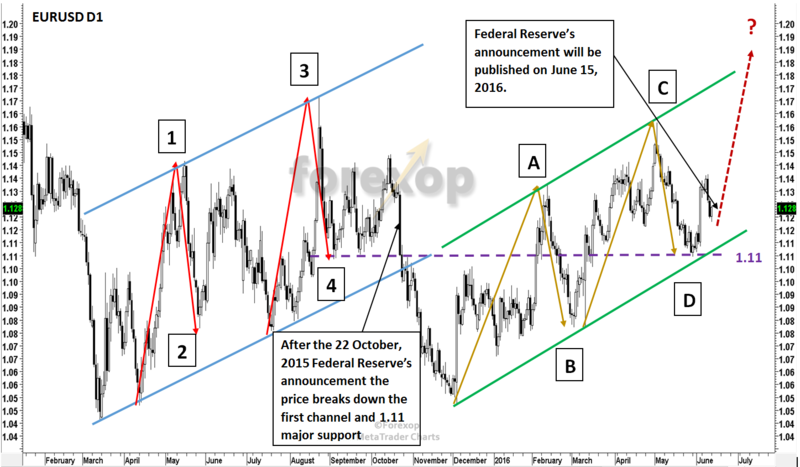 This trade assumes the second channel will be broken up and similarity will cease to exist. 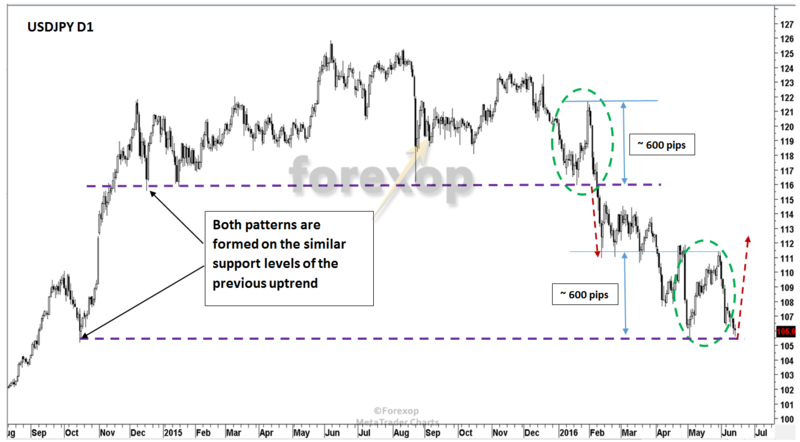 While USDJPY does not have such beautiful similarities as EURUSD, I think the two patterns circled in green in Figure 2 are still quite significant. As such these patterns will probably attract large shorts from “the Crowd”. The first pattern’s minimum is at around 116, while the second one’s is around 106, which gives a difference of 10 figures. EURJPY has the most beautiful medium term trend lines that I have ever seen in my trading career for a major currency pair. 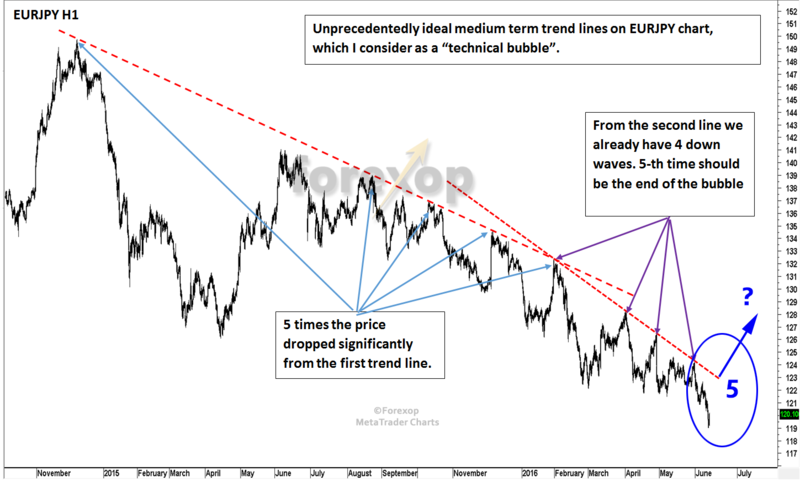 If you have seen more ideal medium term trend lines, please share them in the comments. As I’ve shown in Figure 3 there are 2 unbroken downward slopping trend lines with maximums exactly on the line. On the first line there are 5 maximums and after the fifth maximum we have a big down wave, which continues up to the current point. For the second line we already have 4 maximums, and because the second line is steeper, the price should meet it for the fifth time very soon. Once this happens, the Crowd should start to short EURJPY significantly based on the experience with the first line. Brexit is widely considered as a negative event for the European project and the Euro in general. In Figure 5, I put an example of similar consecutive medium term trend lines. 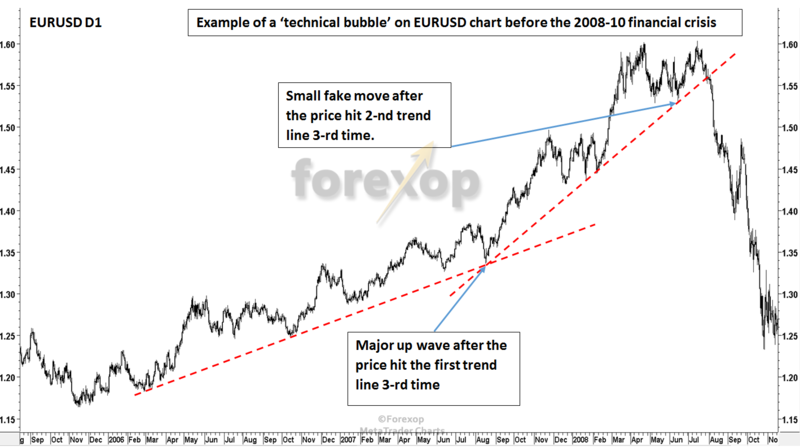 These happened with EURUSD before the financial crisis of 2008. As you can see after the short fake move from the second line 3rd time, the technical bubble burst and the price broke down all the minimums on the second line. 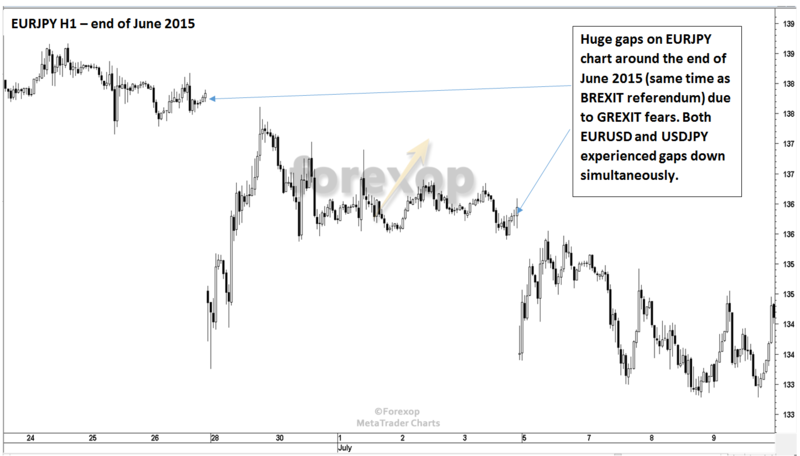 As shown in Figure 4, on June 26 of last year, which is almost exactly the same month and date as the Brexit referendum, EURJPY experienced two huge gaps. Both EURUSD and USDJPY gapped down due to Grexit related risks. For EURUSD the explanation was that Grexit is bad for the European project (and by extension the Euro). Based on the above similarity, market participants consciously or subconsciously will expect the same type of movements for EURJPY during the Brexit. The ideal trade for EURJPY will be to wait until the price meets the second line fifth time and then open a contrarian position betting that that the bubble will burst. I’ve marked this in Figure 4 (blue ellipse). However, I decided to open part of the positions based on this factor now since later the stop loss/take profit ratio may not be as attractive as it is now. My stop loss at this point is 116, the level where the fourth wave from the second line will be equal to the fourth wave from the first line. Take profit is around 127-128, where both lines will be broken up significantly. Entry point is 118.73, which gives take profit/stop loss ratio of more than 3. I only saw this post this morning… Is it too late to do this trades? EURJPY already moved up by 370 points this morning. It’s not too late, since the target for EURUSD is 1.18 and for EURJPY is 127-128. But the suitability of the trades mentioned in the post, significantly depends on circumstances of a particular trader, including its ability to take risk in this highly volatile market. Yes, the main goal of the post is not the trade idea itself, but the discussion of factors that are used in it. However, I would like to add, that the stop level 116 for EURJPY has more protective nature and it is not the final stop for this trade. In case EURUSD and USDJPY move down together, the theoretical stop loss of EURJPY will be the stop for EURUSD (1.10) times the stop loss of USDJPY (101) which gives 111. Far from the market, but still the upside potential is 127-128 and the take profit/stop loss ratio is still very attractive. Due to the high volatility, good money management is key to success. For EURUSD I would like to add that the small new minimum is possible around 1.106, but the picture will not change as a result of that. In regards to the outcome of referendum, its difficult to predict, but I think because things are going well in the UK economy, people will not choose the change. Unemployment level is just 5 %, GDP is not doing bad and so on. In my opinion people generally choose the change when things are going really bad. The timing is very important for the outcome, and the date of the referendum was chosen by the remain camp. Polls can always be skewed and I don’t trust them much to be honest. Great post and trade idea! Thank you for sharing. It’s good to see the whole thought process for once than just a recommendation saying what to do. What I didn’t get though does your idea assume brexit happens or doesn’t happen? On chart 4 it shows the bubble you talked about on EUR/JPY but would you expect that to gap down even lower in the case of a brexit? Even if that could be a temporary movement before a correction takes hold and the bubble pops. I think that brexit happening is much more of a reality than the other events. At least more than the Grexit and Scottish independence. I also think that the official polling could be way out on this. Why? Some of the reports are saying there’s only a 1 in 5 chance of brexit happening. I think more like 50:50 from the above points. Not scientific at all just a hunch. The other thing I see that’s not being picked up in the press is that of this being worse for the euro than the pound. If a brexit vote is delivered I expect a lot of GBP weakness over uncertainty to start but longer term the Pound should well strengthen. GBP will be seen as a safer bet than the euro that is inevitably is going to be hit by further bailouts of the Med countries and as well it won’t be tied to a declining economic block. They are on the change side so the brexit lot need at least ten point lead for the odds to be 50/50. That’s because most people will not want the risk of change even when polls are showing a tight race. Or that is what the polling geeks are telling us. I admit I am clueless to the outcome.